Retail Store Unit Shop Design Consultants. Specialists in Sports & Leisure Clothing Store Design & Shop Fitting Installation. Coffee Houses, Tea Houses, Farmers Market Shops, Wine Bars, Bistros, Restaurants, Cocktail Bars, Delicatessens, Bakeries, Sandwich Bars, Cafes. Bakery Cafes, Boutique Hotels. Independent Shopping Mall Pod Installations, Self Contained Coffee Units. We provide retail Design Consultancy to a number of retail groups, having outlets in locations ranging from the Gun Wharf Quays in Portsmouth, to several locations in Scotland. In Manchester’s Trafford centre we have designed a number of retail units. We also act on behalf of the Trafford Centre owners, Peel Holdings, relating to Health & Safety and other issues. We have worked with the Branded Retail Group to design and fit out their units in the White City Centre in London. 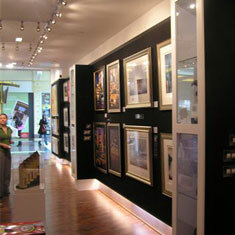 In Harrods, London, we designed and fitted the retail units for Castle Galleries. TK Retail Design has produced retail designs for protected buildings in Salisbury, Cheltenham and Portsmouth. See Profile page for details. We have designed and advised on retail unit development and management in many of the major UK shopping centres. Below you will find the Counties in the UK in which we operate. For a more detailed list of towns click on the County heading. Landlord Negotiations, European Construction & Design Management Regulations, Compliance with the Construction Design Management regs (CDM). Building Occupier’s Safety Responsibilities, Obtained Planning Change of Use, Building Warrant Approval & Listed Building Consent.